Chinese President Xi Jinping and Prime Minister Narendra Modi visited Rwanda in quick succession while on their way to attend the 10th Brics summit in Johannesburg. Both leaders offered financial assistance to the small African country. China gave $126 million for road construction while India offered two lines of credit worth $200 million. It was the first time that a Chinese president and an Indian prime minister had visited Kigali, the capital of Rwanda. Rwanda is the third fastest growing economy in Africa, and the current chair of the African Union. Both China and India have deepening relations with Africa and the back-to-back visits to Rwanda provide the opportunity for comparison of their ties with the continent. The Chinese president’s itinerary included state visits to Senegal, Rwanda and South Africa with a stopover at Mauritius on the way back to China. Modi visited Rwanda, Uganda and South Africa. Indian officials refute the impression that India and China are competing for influence in Africa; both countries have followed different trajectories in their Africa engagement, they say. China has focused on large infrastructure projects while India has concentrated on education, training, medicine and other sectors, which have direct benefit for the people. In Rwanda, Modi presented 200 cows to Rwandans under the Girinka programme initiated by President Paul Kagame to provide a cow to every poor Rwandan family to help increase their income. The last time the two leaders had back-to-back visits to one country was in November 2014 when Fiji Islands hosted Modi and Xi on successive days after they attended the G20 meeting in Brisbane, Australia. In Suva, Modi announced the setting up of the Forum for India-Pacific Islands Cooperation (FIPIC), which has held two meetings of their top leaders. Africa is an important element of China’s Belt and Road Initiative (BRI), the ambitious programme to connect China to different regions of the world through building new roads, railways and ports. China has funded more than 6,200 kms of railway and over 5000 km of roads in Africa, according to Chinese Foreign Minister Wang Yi. China launched a sustained outreach to Africa with the Forum on China-Africa Cooperation in 2000; the form meets every three years and will hold its next meeting in September in Beijing. Economic ties were initial focus of the ties but later diversified to developing closer political and strategic relations. China has been Africa’s largest trading partner since 2009 when it edged the US from that position, and is also one of the main aid donors for many African countries. Africa is China’s second largest source of crude oil. Beijing has relied on Africa for a steady flow of natural resources, including oil, copper, zinc and iron ore, to sustain its manufacturing at home. Xi has described Africa as China’s ‘natural ally’. Bilateral trade was worth $220 billion in 2014 but has reduced in recent years with the slowdown in the Chinese economy. Beijing has also increased its defence cooperation with African states concentrating on military training and sale of modern defence equipment; it formed a China-Africa defence and security forum, which held its first meeting in Beijing in June. Beijing established its first overseas military base in Djibouti on the Horn of Africa last year to provide logistical support to anti-piracy operations of Somali waters as well as increase Beijing’s presence in the region. Aside from trade and aid, Beijing is also expanding its soft power in Africa by setting up more than 80 Confucius Institutes across the African continent. India has a long tradition of political and economic engagement with Africa, especially the eastern African states but China set a rapid pace for strengthening and expanding its relations with Africa. India launched a revamped initiative towards Africa with the third India-Africa summit in October 2015 that brought the leaders and top representatives of almost all members of the African Union for a high profile gathering in Delhi. Political interaction has intensified in the past four years of the NDA government with regular high level visits, including presidential and vice-presidential visits to African countries. But trade and investment levels have dipped in the past couple of years from the high figure of $52 billion in 2014. Indian private sector interest in Africa has declined during this period. the next four years, including one in Kigali by the end of the year. 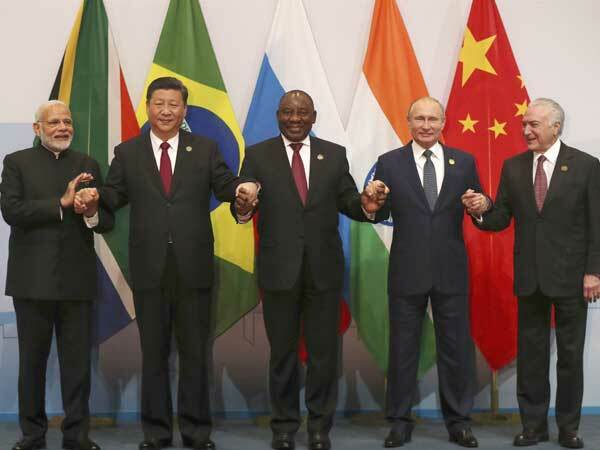 New Delhi’s slower pace has led to it lagging far behind China’s energetic building of its African partnership.